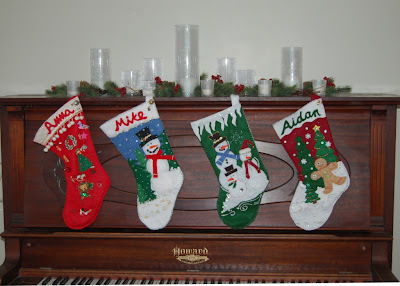 Take the Side Street: New Christmas Stockings: I can sew! 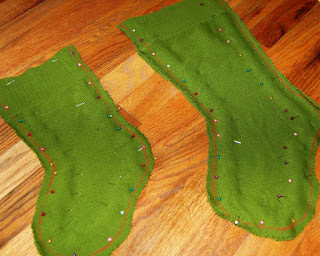 New Christmas Stockings: I can sew! That's right, I made them. Me, baby. Me. I can sew! Well, sort of. Okay not really. But this was really easy and anybody could do it. I love them! I haven't added any embellishments other than the cute pom-poms and I might do that in the future, but for now I'm just glad I made it out the other side alive and I have real, live stockings in my house. 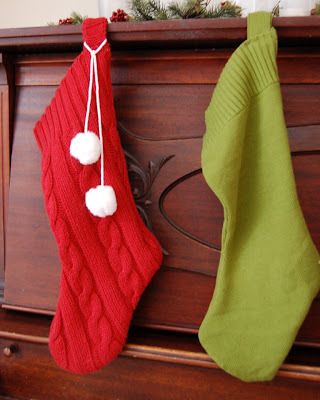 After I read this post at Remodelaholic about making stockings from old sweaters, I was hooked. I dragged my kids to a local thrift store, bribed them with hamburgers for good behavior and found a few great inexpensive sweaters that were just dying to be cut up. Using an old cheerio box I drew and cut out a template for these new stockings. I started with my childhood stocking because I really liked its shape. Then I improved it a tad; for example, I made the toe a teensy bit bigger to better accommodate an orange. 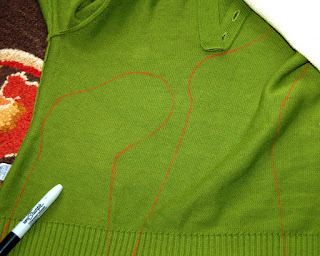 I turned my sweaters inside out and traced the template, making sure the top of the stocking lined up with the thick band knit along the bottom of each sweater. 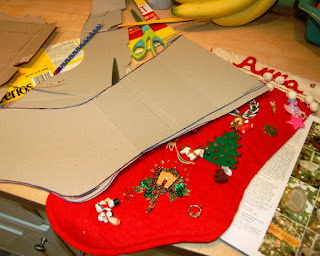 Next I pinned the stockings (yeah, I pinned them like a mad man -- I don't know how to sew... is that too many pins? The more the better, I say.) and cut them out. 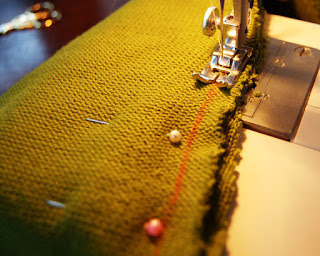 I sewed using Remodelaholic Cassity's instructions - low tension, long stitch length. Thank goodness for people who know what they're doing. Sure, those instructions make sense, but would I have thought of those settings myself without help? Heck no. The one thing I didn't see in the original tutorial that I wanted to add was a tab to hang the stockings from. I wanted it to match the stocking, and goodness knows I can't knit (are you crazy?) so I started to think about where I could find more material from the stockings. 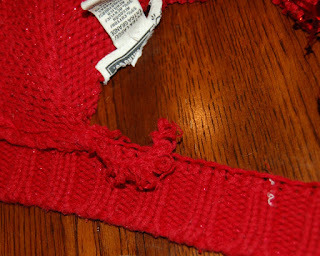 I didn't want it to unravel and I didn't want to have to go to the trouble of sewing then flipping a skinny little piece of sweater right side out. My solution? I discovered that all the "extras" on the sweaters (trim around collar, button placards) were separately knit and then joined to the body of the sweater. So if I was really careful, I could actually cut the sweater away from these trim pieces without risking any unraveling. Brilliant! 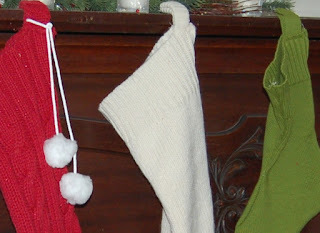 These pieces were thin enough to loop over and sew -- voilà, tabs to hang the stockings from! Like I said, I might go back and add fun embellishments to them after I recover from this sewing experience. I maxed out my crafty quota for a while I think. It's so out of character for me. Though I did have enough time and energy to add a couple pom-poms to the red cable knit stockings -- you know how I feel about pom-poms... I'm a fan. These stockings were pretty easy to throw together, even considering my limited skills. I even made a miniature pet version! Look at these, adorable!! Fabulous job! cute! I love the buttons! oh my gosh.. SO SO stinking cute. Love them. YAY you! Great job! They look fab. These are so cute Anna! I love sweater stockings! You are pretty much an expert stocking maker now!! Pat yourself on the back... I did when I thought of this! (I had been making 2 stockings for about 7 years before this I kid you not... for some reason I thought it would be best if I hand stitched everything, so they had never been finished! I don't think they ever will be either!) Anywho- Great job! Those are absolutely adorable - I am SO impressed!! can't wait to try this out! Thanks for sharing! Very cute! But who gets the little white one at the end of the row? Surely the dog & cat can't SHARE it... omg, you're not making an announcement, are you???? oh my gosh - these are so adorable!! makes me wish i'd seen this before i made mine- because yours are so much cuter!! I love the colors and the texture of the sweaters. I have some olive green silk stockings that I am so tired of and I am looking out for something new and cute. This is a contender for the new stockings! These are so cute! I love the colours that you chose - something about that green makes me think vintage-y, relaxed, rustic Christmas!! Found your post via Centsational Girl's link party! Yes, you can sew! 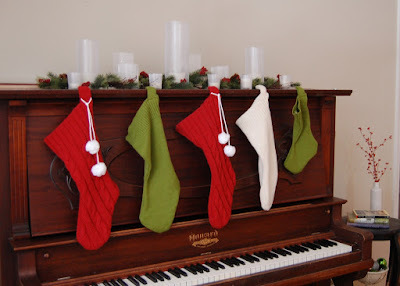 Your stockings look great! well, those are just SO cute! nice job!! cheers from the Centsational Girl Holiday Craft Party! What an awesome idea! I am your newest follower! Please follow me at http://CraftyCierra.blogspot.com/ and dont forget to enter my giveaway for a fun Christmas Activity Book! If you are interested in doing a blogswap, please email me! CierraLarsen@hotmail.com Thanks! Wow! You are super talented. These look great!! This was SUCH good timing, i can't thank you enough! We are about to have "baby's first christmas" in our home and I was wanting to make a stocking from an old sweater so that it matches my husband and my stockings.... i knew i wanted it, but wasn't sure how exactly to execute it. Thank you! These are so cute! I might have to give it a try! You did a great job! Thanks for sharing on Someday Crafts. love these, wish I knew how to sew. I made a Christmas Stocking using felt and hot glue this year to match another store bought stocking since I couldn't find any others that matched. What a awesome idea... I love it. I'm going to give this a try.